The Wiremill is a small to medium-sized power-generating windmill that could be deployed on wires or poles. Rather than having a set of blades spinning, the whole device (casing) spins around a fixed centre, which houses a dynamo-type power generation device. The principle is similar to wind-driven ventilators that are fitted to roofs or sometimes vans or buses. Wiremills could be made in different shapes or sizes, and could be coloured to blend in with the surroundings. They could be fitted for permanent use, or models could be developed that could “clip on” to poles, wires or cables. Multiple Wiremills could be used above each other. A special model could be developed to fit the top of flagpoles or masts, for permanent use. Wiremills could be deployed on masts that hold up equipment on top of buildings, on flagpoles, on bridges equipped with cables or wires, or “forests” of masts with wiremills could be specifically “planted” atop buildings or on open terrain in the city and elsewhere. 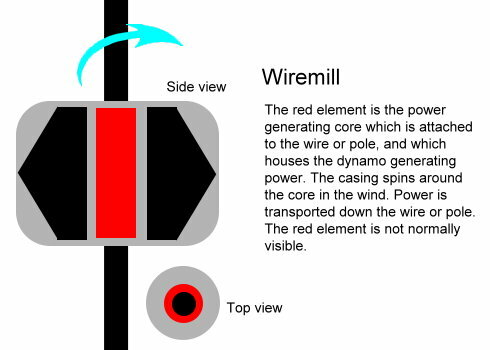 The main purpose of the wiremill is to generate some extra power, simply because there is an unused wire or pole nearby so why not use it. In large numbers, the wiremills could contribute significantly to power generation. The idea is that the wiremill is to be made from cheap materials, including recycled metals, and be designed so that it can be quickly deployed to wires, cables and poles of different sizes. Power cables should be attached by means of a plug system (like one plugs a headphone into a music player) so that wiring can be done quickly. The product range should include different “base stations” where power is collected in batteries and/or standardized for supply to the grid. If you like this idea and you work in a type of industry where this is relevant, I would be happy to discuss in more detail, answer questions or assist in other ways. For details and contact information please see the “About itimes3” page. Disclaimer: Any trademarks mentioned herein are the property of their respective owners. All usage of this site is entirely at users risk.